Fernando Zamith, from the University of Porto, launched during the I Congress on Cyberjournalism a book which contains his master dissertation work. The book’s title is Ciberjornalismo: As potencialidades da Internet nos sites noticiosos portugueses [Cyberjournalism: The potenciality of the Internet in the Portuguese journalistic websites]. The books is divided in five chapters plus a conclusion. First of all, Zamith analyses which is the impact of the Internet in journalism. In the second chapter, he explains the characteristics of the new medium: hypertext, multimedia, interactiviy, personalisation, memory, instantaneity, ubiquity, hypermedia and contextualization. The third and fourth chapters are devoted to the field research done in the Portuguese online newspapers, and how they get profit of the characteristics to be measured. In the fifth chapter, Fernando Zamith explain which is the scenery of online media in his country. The main conclusions of the research are: the Portuguese online newspapers use very few hypertext, multimedia and interactivity; they give access to their archives, but get very few profit from it; the rhythtm of information renewal is very low; and they haven’t realised how important is the ubiquity Internet offers. Personalization is also very poor. Guillermo López, teaching at the University of Valencia (Spain) has launched a new book. It is a research on the online media of the autonomous community of Valencia, entitled Los cibermedios valencianos: cartografía, características y contenidos [The Valencian Cybermedia: cartography, characteristics and contents]. Dr. López and his team have carried out a complete catalogue and research of 232 online media. The book has been published by the University of Valencia in pdf format, and can be downloaded for free. The website of the book also offers additional contents: a brief version of the conclusions, the catalogue, and the analysis variables. The audiences of the media analysed are periodically revised as well. This is the second time Dr. Guillermo López publishes a pdf book on cyberjournalism. As an editor, he published in 2008 a volume entitled Comunicación local y nuevos formatos periodísticos en Internet [Local communication and new journalistic formats on the Internet]. This book also can be downloaded from the Web, and includes some papers of a seminar held at the University of Valencia in 2008 on the situation of cybermedia in Spain, the especific case of Valencian cybermedia, and on the new format of the online journalism. López García, Guillermo et al. Los cibermedios valencianos: cartografía, características y contenidos. Valencia: Servei de Publicacions de la Universitat de València, 2008. “One of the advantages of online distribution which I can control is that I don’t have to permanently fix the book’s contents. Like contemporary software and web services, the book can change as often as I like, with new “features” and “big fixes” added periodically. I plan to take advantage of these possibilities. From time to time, I will be adding new material and making changes and corrections to the text”, explains the author. 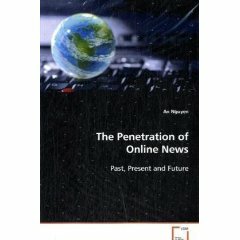 An Nguyen, lecturer in Journalism Studies, University of Stirling (Scotland), has just published a new book on cyberjournalism: The Penetration of Online News. Past, Present and Future. Dr. Nguyen comes from the University of Queensland, Australia, where he completed his PhD in Media and Communication Studies. He was also a journalism practitioner in Vietnam. Currently he is teaching at Stirling. Interested in online journalism and its audience, he has published articles on online journalism from 2003 onwards. Some of them can be accessed from his own website. An Nguyen wonders in his book whether “online news gradually displace and then replace older news forms”, as well as whether “the rise of blogs, forums and other ‘Web 2.0’ platforms spell a slow death of journalism”. From an interdisciplinary and international perspective, he explains the the socio-technical dynamics of the diffusion of this new form of making news and deals on the take up of news technologies in the newsrooms. Another book on cyberjournalism has been published in Germany this year, about Austrian online media: Österreichische Online-Medien, by Dieter Marek and Moritz Omasits (Facultas Universitätsverlag, 2008). Complete book reference: Nguyen, An. The Penetration of Online News: Past, Present and Future. Saarbrücken: VDM Publishing, 2008.